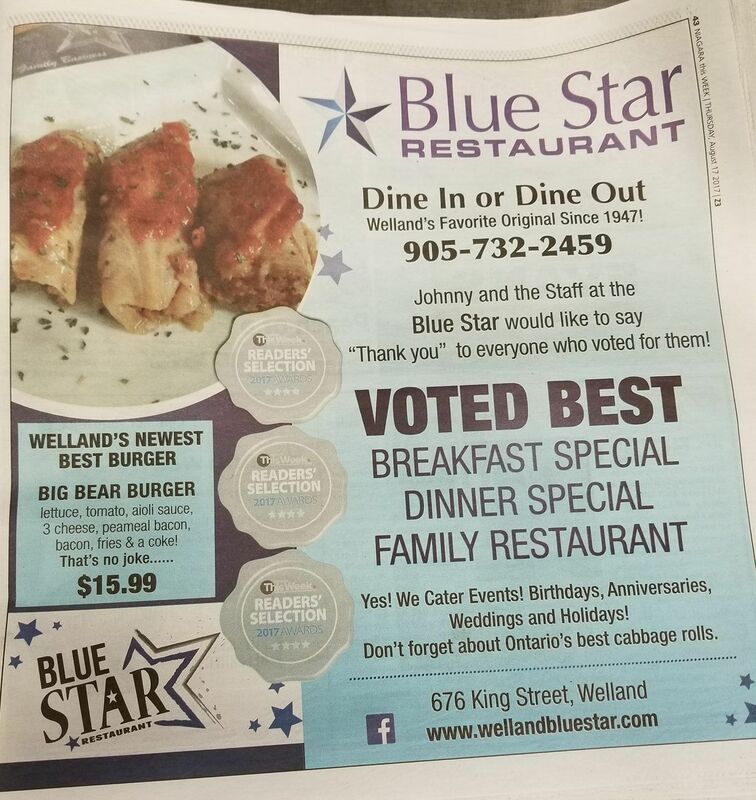 The Blue Star restaurant in Welland doesn’t just have customers, it has lifers and they haven’t missed too many calls to the table. Kids who came in to eat with their parents in the 1940s are still pulling up a chair. For a restaurant without any airs, the Blue Star has a wall full of awards that's say the community loves them and feels right at home. It was homebase for Peter Kormos and both Prime Minister Pierre Trudeau and most recently Prime Minister Stephen Harper have been around for a meal. From Pierogies to Politicians, and from the Blue Star's signature broasted chicken to the banter that mixes with clink of China and coffee pots, the Blue Star is both landmark and a legend. Family owned and operated since 1947, the Blue Star is co-owned by John and Renée Plentai and brother-in-law Brian Mareau. Read the fascinating history, a family story, a success story on Facebook at Blue Star Welland. 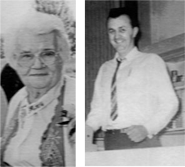 Since the early days with John's parents Charles (he knew every body as a friend) and Gertrude (the heart behind the restaurant). It's always been community first. From comfort food to low-carb options, it's a big choice menu with new items being added all the time. The Blue Star pioneered the broasted chicken in Welland and customers say it's still the best. There's pierogies and cabbage rolls, salads and soups from Borsch two French Onion, muscles to sweet potato fries, turkey poutine, lasagna, steaks and hamburgers and the vegitable kabob. Homemade pies baked daily include apple, cherry, blueberry, Lemon meringue, chocolate cream and the ultimate coconut cream pie. The Blue Star is undergoing many upgrades with the new booths and a new menu. It ties perfectly with the city's plans for King Street revitalization area. Catering community events remains a big part of the operation and the friendly atmosphere will never change. "We've tried to stay true to the original recipe" says Renée. The same is true for John who makes everyone feel welcome with his signature expression "you're the best." Renée credits 37 staff members including Rudy Cools who has been the Blue Star chef for more than 30 years. "This staff is The frontline. We appreciate each and everyone of them for their hard work and dedication." John hopes his children, Desiree, twins John and Charles and Jillian we'll carry on the legacy. "he's always joking, always happy, hard-working he keeps a spirits up," says Desiree. And there's high praise from the Blue Star staff including Mary Ann Houser and Tina Miekle who say "I couldn't ask for a better boss. He's always been there for his staff." The Blue Star is a success story, a story of taking a gamble, a strong belief in the future and a lot of hard work, dedication and people skills. © 2019 Blue Star Restaurant. All rights reserved.